An Air Tray Dryer Is used for the best drying results in conventional process. It consists of a double-walled cabinet with one or two doors. The gap between two walls is filled with light resin-bounded fibreglass wool insulation material to avoid heat loss. The doors are provided with gaskets to avoid air leakages from the front side of the door. Stainless steel trays are placed inside the chamber. 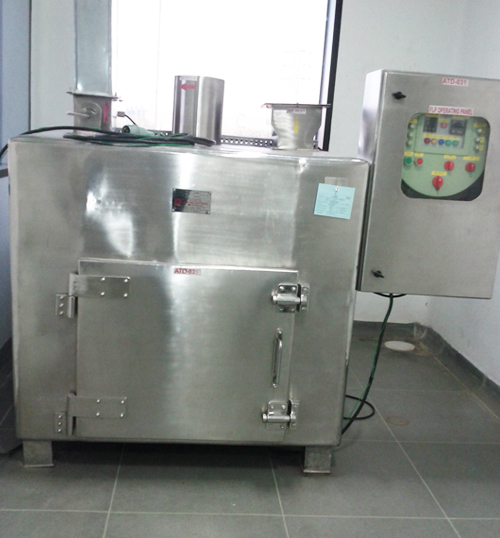 cGMP model dryers are designed to dry specific products. Capacity: Lab model to suit 10kg powder - 6, 12, 24, 48, 96 and 192 trays. Standard, GMP & cGMP models available with SS 304/SS, 316/MS internals and externals. Construction: External: 2mm thick; internal: 2mm thick. Surface Finish: External: polished to 180 grit man finish; internal: buffed to 220 grit mirror finish. Inlet & Outlet: Pharmaceutical and industrial tray dryers have a 5-micron pre filter at the inlet and a manually adjustable damper at the exhaust. Doors: Doors are provided at the front and/or rear side of the dryer. The door lips are lined with silicon rubber gaskets to prevent air leakages. Suitable locking arrangement is provided for the doors. Air Circulation: This is done by specially designed re-circulation blowers inside the dryer. Blower capacity, static and design depend on the size / model of dryer. Heating: Dryers are supplied with either steam / electric / thermic fluid / hot water heating system. Suitable heating coils / calorifiers are provided. Temperature Control: This is done by an electronic digital temperature controller fitted to the control panel. The temperature control in the dryer is fully automatic. Trays: These are available in SS 304/316. All trays are fully dry-pressed and have curved corners. Trays are buffed to a mirror finish. They are also available in aluminium / polypropylene / FRP / MS galvanised according to client requirements. Trolley: A trolley is provided in the dryers to accommodate trays. Trolley tracks are used to load and unload the trays into the dryer. Electronic Panel: An automatic control panel is fitted on the side of the dryer. It consists of starters, contactors, safety relays, circuit breakers, indicating lamps, push buttons, timers, controllers etc. Backed by our efficient workforce, we are capable of manufacturing, supplying and exporting Air tray Dryer. Available in various models, these products are known for their longer service life, corrosion & abrasion resistant and easy maintenance. Our Air tray Dryer can also be customized as per the specifications laid down by the customers. We also check all the products on various parameters to ensure flawlessness. • The fan of the dryer is made of Mild Steel, AISI 304 / 316 and other material. • The internal side of fan and radiators is covered with mesh to give complete safety on operations. • The internal surface of the dryer is rounded, which result in least airflow resistance and low pressure. • The outer body of the product is provided with rounded edges. • The shafts are well balanced to provide optimum functional usage.